Your order will ship MONDAY if placed in the next 20 hours 50 minutes . Enter your shipping address zip code to receive an instant delivery date estimate from UPS. Remington Managed Recoil 270 Winchester Ammo 115 Grain Core-Lokt Pointed Soft Point ammo for sale online at cheap discount prices with free shipping available on bulk 270 Winchester ammunition only at our online store TargetSportsUSA.com. 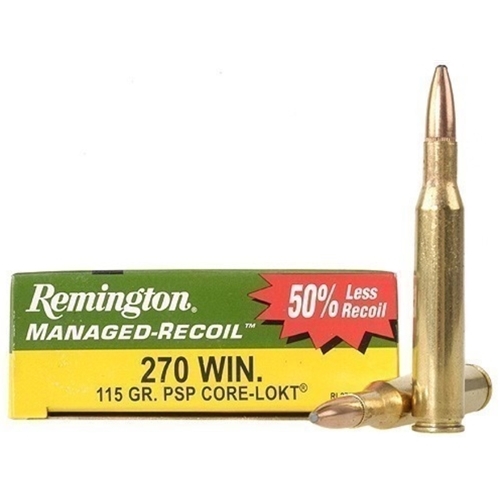 Target Sports USA carries the entire line of Remington ammunition for sale online with free shipping on bulk ammo including this Remington Managed Recoil 270 Winchester Ammo 115 Grain Core-Lokt Pointed Soft Point. Remington Managed Recoil 270 Winchester Ammo 115 Grain Core-Lokt Pointed Soft Point ammo review offers the following information; Remington Managed Recoil 270 Winchester ammo feature 115 Grain Core-Lokt Pointed Soft Point bullets. Remington Core-Lokt is ideal for the hunters with a desire for filling their deer tags. For more than six decades, Remington Core-Lokt has remained the leader in centerfire deer ammunition. The Core-Lokt bullet is one of the most effective bullets developed and utilizes the original controlled expansion bullet design. Core-Lokt line by Remington provides a range of bullet weights for every centerfire hunting caliber. Remington Ammunition presents the shooter with an extensive variety of premium bullet developed to combine with the strict manufacturing tolerances to create ammo with which any shooter would be willing to take the perfect shot. With a muzzle velocity of 2710 feet per second and muzzle energy of 1875 feet pounds making the Remington Managed Recoil 270 Winchester an outstanding choice for hunting ammo. Remington Managed Recoil 270 Winchester ammo is new production, non corrosive, reloadable, and features brass casing and Boxer primers. 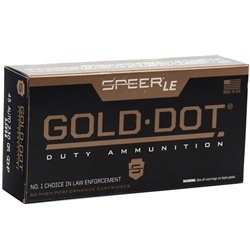 Remington Managed Recoil is packaged in boxes of 20 rounds and cases of 200 rounds with free shipping available on bulk case orders of this 270 Winchester ammo from Target Sports USA. Target Sports USA is great. Love this place and the products. Remington Managed Recoil 270 Winchester Ammo performs well. Works well, Great for target practice.